A Board of Review has not approved this Summary Report. It is intended as a safety and training tool, an aid to preventing future occurrences, and to inform interested parties. Because it is published on a short time frame, the information contained herein is subject to revision as further investigation is conducted and additional information is developed. The CDF Green Sheet on the Cedar Fire was published without comments from Novato Fire District Captain Doug McDonald. The Cedar Fire was reported on Saturday, October 25, 2003, at approximately 5:37 P.M. The fire, burning under a Santa Ana wind condition eventually consumed 280,278 acres and destroyed 2,232 structures, 22 commercial buildings, and 566 outbuildings, damaging another 53 structures and 10 outbuildings. There was 1 fire fighter fatality, 13 civilian fatalities and 107 injuries. The fire was under Unified Command with the United States Forest Service, the California Department of Forestry and Fire Protection, and local government. On October 29, 2003 four personnel from Engine Company 6162 (E6162) of the Novato Fire Protection District, as part of Strike Team XAL2005A, were overrun by fire while defending a residential structure located on Orchard Lane in the community of Wynola, in rural San Diego County. The fire made a wind-driven run through heavy brush directly toward their position, covering a distance of approximately one-half mile in just less than two minutes. One crewmember died at the scene and the three others were provided treatment and then airlifted to the University of San Diego Burn Center. 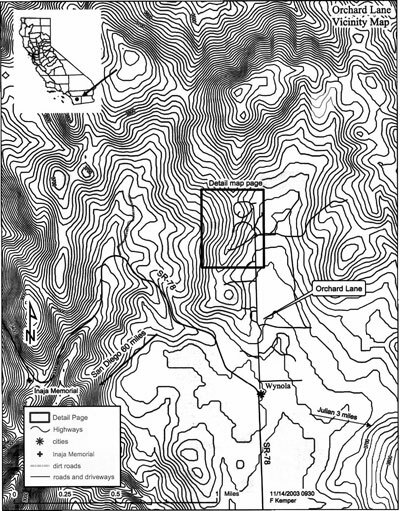 The accident site was located on a ridge near the origin of the San Diego River drainage. Slopes at the accident site range between 12-20%. The elevation at the accident site is approximately 3800 feet, 400 feet above the bottom of the drainage. The Palmer Drought Index shows a preliminary reading of -2.88. The fuel models in the immediately area of the accident site were Fuel Model 4-brush (with at least 90% crown closure) and Fuel Model 1-grass. Live fuel moisture values were below critical levels. At the time of the accident a strong onshore pressure gradient had developed with sustained winds of 17 mph and a gust of 31 mph out of the west. At 2:30 P.M. at the accident site the temperature was 70 degrees and the relative humidity was 30%. As all the fire environment factors of fuel, wind and topography came into alignment there was a sustained run from the southwest directly to the accident site as a running crown fire. Flame lengths were calculated to be in excess of 78 feet, fire line intensities in excess of 73,989 BTU/ft/sec, and rates of spread in excess of 16 miles per hour (for the maximum wind speed recorded at 31 mph). It took the fire a little under 2 minutes to go from the bottom of the slope to the top, a distance of .46 miles. All fuels, both dead and live were totally consumed below the accident site. Road Conditions: The access to the accident site is a curving ten-foot wide, 490-foot long cement driveway proceeding uphill to the residence. The driveway is overgrown with brush and requires trimming to allow ingress. At the ridge top, the driveway makes a sharp 90 degree curve to the south that finally orients in line with the ridge along the west side of the house. Make/Model of Equipment: E6162 is a series 2000 International similar to a CDF Model 14. It is outfitted with a 4-person cab; 500-gallon tank and a 500 gallon-per-minute (GPM) pump. The engine is 8 feet 8 inches wide, 24 feet long, and 9 feet 4 inches tall. By 11:00 A.M. on October 29, 2003, the Cedar Fire had crossed Highway 78 spreading along the ridge on the west side of the San Diego River drainage. The fire was making short runs (averaging less than 100 yards) in the grass, brush and oak trees. Helicopters were making bucket drops in an effort to keep the fire on the west side of the San Diego River drainage. The fire on the west side of the drainage moved up canyon and gained elevation. Under the influence of a west wind, higher up in the drainage, the spread to the northeast, burning the property at 902 Orchard Lane. (See Fire Spread Map) Spot fires are observed in the area and both helicopters and ground resources are moved to the area of Orchard Lane. This includes ST2005A, with E6162, which has a four-person crew including a Captain, two Engineers (who will be referred to as Engineer #1 and Engineer #2) and a Fire Fighter. At about 12:15 P.M., the Strike Team Leader for 2005A, after reviewing conditions, assigns E6162 to the residence at 920 Orchard Lane (the site of the accident). No engines are assigned to 902 or 930 Orchard Lane. (See Orchard Lane Detail Map) A Captain and an Engineer, in a utility vehicle, arrive at 902 Orchard Lane and begin to fire out around the residence. While the Captain from E6162 walks ahead to evaluate, E6162 backs up the driveway as overhanging brush is cleared by the crew of E6162. (See Accident Site Sketch) The Captain returns to the engine and expresses some concern about the conditions. The Captain and Fire Fighter return to the residence and determine, based on a large cleared area to the southwest side of the property, that the location is defendable. The cleared area provides for a view to the west and northwest, tall brush and drifting smoke restricts the view to the southwest and no fire activity is visible. They observe smoke from the fire to the north, near 902 Orchard Lane, which is flanking towards them, and determine it to be the greatest threat. Small runs of fire are taking place across the canyon on the west side of the drainage. The crew observes an up-canyon and up-slope wind, at about 7-10 mph, on a line from where Highway 78 crosses the San Diego River towards the location of 902 Orchard Lane, a natural saddle. The crew develops and implements a plan that includes: brushing and firing below the house; identifying the house and/or engine as a refuge and placing an axe at the back door; using a residential ladder on the house; laying out 11/2" hose lines for engine protection all in an attempt to defend the structure. The Captain advises the crew of a fire fighter firing out in the area north of the garage. Engineer #1 observes fire on the ground near the garage, and begins strip firing from that location. The Captain throws fusees down the slope into the heavy brush below the area strip burned. This results in a partial burn. At about 12:25 P.M. the Captain and Engineer, in the utility vehicle, arrive at 930 Orchard Lane. They begin firing around the structures from south to north along the west side of the structures. The Captain instructs the Engineer to take the line of fire to the next house to the north, which is 920 Orchard Lane. The Engineer begins to lay fire towards the north in 15-foot brush with dry grass underneath. Active burning conditions result from this firing and the Engineer does not continue north. Fire from the firing operation makes a run east towards the driveway, where a helicopter bucket drop slows it down. At about 12: 35 P.M. the Strike Team Leader for 2005A arrives at the location of E6162 and reviews their progress and plans. The sky is clear overhead and the winds are moderate. About five minutes after the Strike Team Leader leaves the scene, the crew of E6162 observes an increase in the fire activity below them. As the fire intensity below them increases the crew retreats to the passenger side of the engine. The Fire Fighter staffs a 11/2" hose line at the front bumper, while Engineer #2 staffs a similar hose line near the rear bumper. Engineer #1 is standing at the rear duals. The Captain is believed to be towards the rear of the engine with the only portable radio. Bushes along the patio behind the crew are burning. The Fire Fighter drops his line and runs in the direction of the raised patio. Upon leaving the protection of the engine he experiences severe thermal conditions. The Fire Fighter leaps past the burning bushes and onto the patio, followed by Engineer #1 who runs to the steps, stumbles and falls to his knees at the top of the steps, recovers, and continues to retreat behind the rear of the house, following the Fire Fighter. Engineer #2 puts on a hose pack stored in the rear compartment of the engine. Arriving at the rear door, (approximately 170' from the engine) the Fire Fighter and Engineer #1 use the axe to force entry into the residence. Realizing that no one else is following them, they decide to return and look for the Captain and Engineer #2. At about this time, a radio call is heard indicating a fire fighter is down. Fire burns the charged hose lines (at the rear of the engine) causing the tank to be pumped dry. The Fire Fighter and Engineer #1 return to the south end of the house. As they near the southeast corner they observe solid flame blowing sideways across the patio. They then see the Captain stagger around the corner out of the flames. He appears to be dazed. The Captain tells them that Engineer #2 has fallen and states they need to go back for him, the Captain then turns to go back after the fallen engineer. Engineer #1 and the Fire Fighter determine the patio area is untenable. The three retreat back into the residence. Inside they discuss a plan to search for Engineer #2. After a moment, they open the front door to check the front of the house. Intense heat surges in and the door is closed. After a few minutes, a second attempt is made to try the front door. Engineer #1 exits to search for the missing Engineer followed by the Fire Fighter who turns back when he is hit by a burst of heat. Engineer #1 moves towards the front bumper line taking small shallow breaths. Engineer #1 observes the body of Engineer #2 on the patio and continues to the bumper line, advancing it towards the body of the down Engineer. Engineer #1 gets a 10-15 second burst of water before the tank is dry. An increase in heat forces Engineer #1 to take shelter inside the engine. Engineer #1 considers deploying the extra fire shelters stored in the cab. Concerned that the Fire Fighter and Captain may come searching for him, Engineer #1, taking a single breath runs to the front door and rejoins the other two. The burning structure forces the three to make their way to the engine. The Fire Fighter disconnects the two protection lines. Engineer #1 drives the engine down the driveway to the east. Heavy dark smoke obscures the view and Engineer #1 feels his way, using the feel of the tires dropping off the edge of the pavement to make corrections. At one location the engine is stopped to avoid running off the driveway. Concern about being overrun again convinces them of the need to continue. The Captain transmits a "fire fighter down" message. The crew continues south on Orchard Lane to a location just short of Highway 78. The three exit the engine and advise a Hot Shot crew that they have been burned. The Hot Shot crew provides medical assistance prior to the three being flown to a hospital burn unit in San Diego for treatment. The Fire Fighter had minor inhalation injuries to the respiratory tract and first degree burns on the face (under the goggles), and small patches of first-degree burns on the back between the shoulder blades. Engineer #1 received second-degree burns on the tip of the nose and a two-inch by three-inch area on the back. First-degree burns were also sustained on all knuckles of both hands and an additional two-inch by three-inch area on the back. The Captain received second-degree burns affecting approximately 28% of the body including the face, ears, arms, elbows, and legs as well as sustaining a respiratory inhalation injury. Engineer #2 died while running for the house and received extensive burns over most of the body. Plastic lens covers on all four sides of E6162 melted or showed heat damage. The vinyl hose bed cover for the driver's side pre-connect and both rear hose bed covers melted. There was no obvious heat damage to the paint and the engine was driven away from the accident site. The wood-frame stucco house at 920 Orchard Lane had a rolled paper and tar roof, and a large wooden deck attached to the north end of the house. The house burned to the ground after the surviving crew members left the scene. #1. Keep informed on fire weather conditions and forecasts. This needs to be an on-going activity based on all available information. This includes fire weather watches and red flag warnings. #2. Know what your fire is doing at all times. This should include the main body of the fire and any fingers and hotspots. If there is any firing taking place in the area, this fire activity needs to be monitored also. #3. Base all actions on current and expected behavior of the fire. It is important to consider not only the current and expected behavior, but consideration should be given to the unexpected or possible worst-case scenario. #5. Post lookouts when there is possible danger. The presence of a posted, dedicated lookout assigned to the division or area of greatest concern/threat would have allowed for an observation of the fire in the drainage. #6. Be alert. Keep calm. Think clearly. Act decisively. Command presence during times of stress is imperative. The leadership demonstrated during this event directly saved lives. #7. Maintain prompt communication with your forces, your supervisor and adjoining forces. This needs to be accomplished at all levels within the operation, including the crew level, strike team / task force level, the division / branch level and the operational level. If air resources are moved into and out of an area this needs to be communicated. #9. Maintain control of your forces at all times. When positioning, or repositioning resources during a fluid fire environment, it is critical to ensure that all resources are accounted for, and to the greatest extent possible, know the location of their adjoining forces and the tactics being employed. #10. Fight fire aggressively, having provided for safety first. Aggressive actions generally place fire fighters in close proximity to the fire's edge. Safety mitigations must be part of the immediate plan. In this case safety of the crew was demonstrated by aggressive actions taken at the structure to create a more favorable position, which included a safety zone. When reacting to extreme fire behavior accompanied by a rapidly spreading fire, the safety plan needs to be continually evaluated and updated. It appears that all of the necessary Personal Protective Clothing and Equipment was being worn correctly. #4. You are in an area where you are unfamiliar with local factors influencing fire behavior. Out of area / region crews need to be briefed on local conditions and fire behavior prior to going onto the fireline. #5. You are uniformed on strategy, tactics and hazards. All tactics being implemented both within and adjacent to the assigned division need to be known and communicated to all. This is especially true of firing operations. #11. You are in heavy cover with unburned fuel between you and the fire. The inability to estimate fire spread in heavy fuels is often cited as a causal agent in fire line injuries / deaths and is directly related to Situation #12. #12. You cannot see main fire and you are not in communication with anyone who can. The lack of knowledge about exactly where the leading edge of the fire is and what it is doing, places those that cannot acquire that information at considerable risk. #15. You notice that the wind begins to blow, increase or change direction. While often noticed, if not noticed and communicated in time, any required change in the pre-determined safety plan may not allow for the plan to be communicated and implemented. #17. You are away from a burned area where terrain and/or cover makes travel to safety zones difficult and slow. The ability to reach a safety zone, as opposed to an area of refuge, needs to be carefully scrutinized, allowing for a reasonable time frame under the worst-case situation. When there is an unexpected shift in wind direction or speed. The unexpected shift in direction and rapid increase in the speed of the wind were a direct contribution to this accident. Fires run uphill surprisingly fast in chimneys, gullies, and on steep slopes. This fire responded to an upslope / up-canyon influence as it spotted across the highway and into the upper tributary of a major drainage. 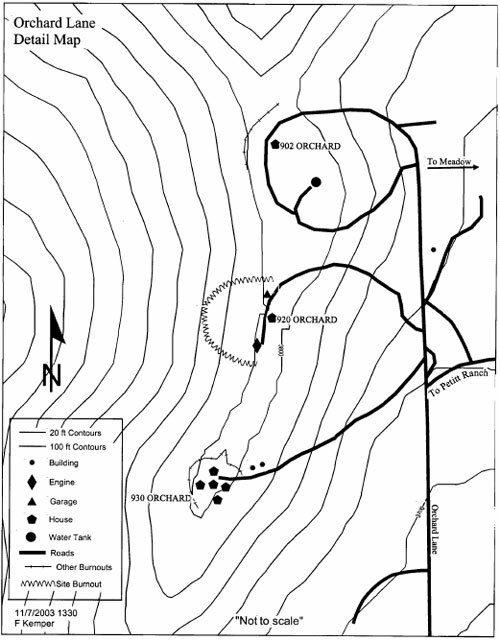 The accident site was located on a high ridge and at the top of a significant chimney. Lookouts dedicated to that role need to be identified and have proper communication ability. The Lookout location, and time they will be in place, needs to be known by all crews assigned to that division / location. The use of aerial reconnaissance and aerial lookouts needs to be used when it is the only viable lookout that can adequately perform the function. As prompt radio communication begins to degrade, regardless of the reason, the propensity to rely on face-to-face communication requires that everyone realize the increased time it will take to ensure all who need to know specific information have in fact received it. Lookouts need to have a clear understanding of desired "trigger points" and to whom and how they will be communicated. Although not a common occurrence, on this incident the loss of a repeater (destroyed by fire) further complicated radio communications. Command staff must ensure that any and all significant weather information is broadcast to all levels of the incident organization. The use of VHF and 800 MHz radio frequencies and the potential for lack of communication on the incident, specifically at the division level must be recognized by all personnel. The assignment of multiple tactical frequencies within a division (air resources, structure group, division tactical channel) must be known, and/or monitored for critical radio traffic. Escape routes that are identified at any given moment, need to be constantly evaluated and re-evaluated. The utilization of vehicles / structures as refuge and/or Safety Zones needs to be clearly discussed and assigned accordingly. Creating additional defensible space around structures must be included in the re-evaluation of the number, type and location of escape routes. Escape routes for both vehicular and foot traffic need to remain viable throughout the operation and during the worst-case scenario. Safety zones need to be identified and/or established and communicated to all who may have to use them. Their size and location needs to be based on both current and expected fire behavior. While safety zones may be adequate for what is expected, they need to be applied to the burning conditions present to ensure they are adequate. The difference between safety zones and refuge areas needs to be clearly understood by all who may use them. The pros and cons of each and the desired sequence of use also need to be communicated. Safety Zones should allow for the required level of safety from as many angles as possible. 1. Emphasize the need to establish a dedicated "Lookout" position into the ICS organization. 2. Need to review the 10 Standard Orders, 18 Watch Out Situations, and LCES for specific applicability to wildland/interface operations. 3. Need to address interoperability of communication systems within the fire service community. Specifically the 800 MHz versus the VHF frequencies. 4. Need to develop systematic process to inform out-of-area/region resources with local conditions affecting the fire environment. 5. Need to evaluate structure defense philosophies, strategies, and tactics and incorporate into standardized training, technology and procedures. 6. Approximately 1.5 miles southwest of the entrapment site, 11 fire fighters were killed in a fire storm on the Inaja Fire. (See Orchard Lane Vicinity Map) The Inaja Fire started November 25, 1956, under strong Santa Ana winds, the fatalities occurred when the winds turned to the west.